I prefer to work on tightly stretched linen canvases. I use a finely woven Claessens Belgian Linen attached to extra-strength wooden frames. My stretchers are purchased from Twin Brooks Stretchers, Lincolnville, Me. These come with a mechanical corner fastening system, which is a vast improvement over traditional wedges. This system eliminates the need for re-stretching and always keeps my painting surface tight. The Claessens linen is already primed with two layers of lead white paint so I can immediately begin drawing after the canvas has been stretched. While the finished drawing is rather detailed, it is almost completely linear. The drawing is done in both pencil and a permanent India ink. 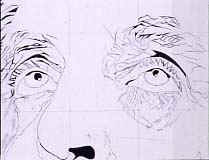 No shading is done at this stage except where it will help to bring together some of the complicated patterns. Some of the darkest areas are blocked out entirely.